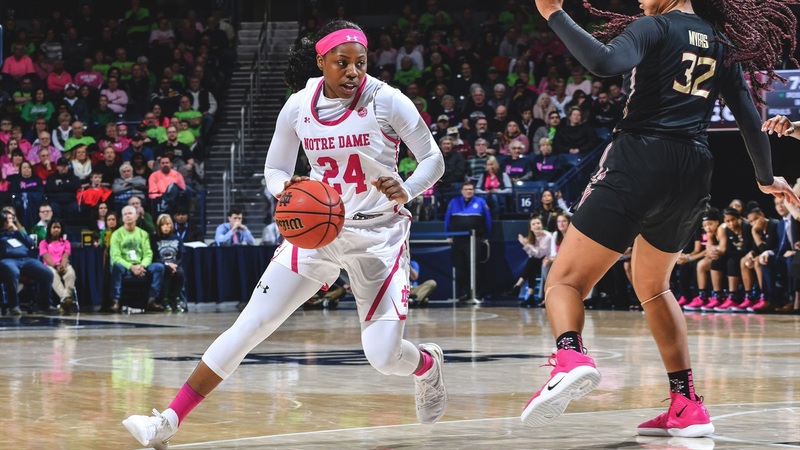 Arike Ogunbowale and Jessica Shepard combined for 53 points to help the Irish to a comfortable 97-70 win against #24 Florida State at Purcell Pavilion. Ogunbowale made her first four shots from the field and her hot start resulted in 27 points to lead all scorers. Ogunbowale was 9 for 16 from the field including 5 for 7 from three. She also went 4 for 4 from the line, and added 5 assists and two steals with zero turnovers. After ND surrendered 21 offensive rebounds in last Thursday’s game against Miami, Ogunbowale grabbed eight defensive rebounds (and 9 total). Meanwhile, Shepard was dominant in the paint, scoring 26 points on 12 for 22 from the field. She had 8 rebounds, 2 assists and a steal. She made her only two free throws of the game, which improves her performance from the line to 81.0% in conference play (34 - 42). Shepard had 10 and Ogunbowale 9 points in the first quarter to stake the Irish to a 28 to 22 lead after the first ten minutes. The Seminoles kept the game close by hitting 4 of 8 three-point baskets in the quarter and 8 of 16 overall. Notre Dame kept up the offensive pressure in the second quarter outscoring FSU 24 to 16 to grab a 14 point halftime lead (53-38). Ogunbowale went 2 for 2 from three-point range and scored 10 in the quarter. FSU only hit 5 of 15 second quarter attempts (33.3%). 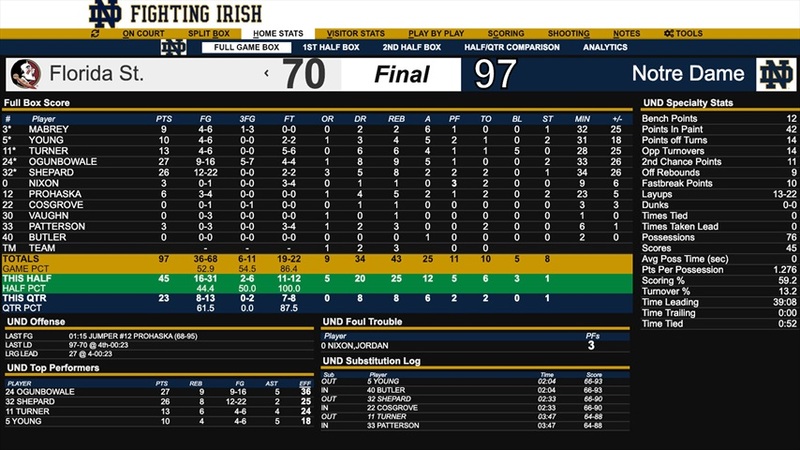 By halftime, ND had 13 assists on 20 made baskets and just 4 turnovers. Florida State came into the game ranked in the AP poll and in a four-way tie for second place in the ACC with Notre Dame, Miami and NC State. Head coach Sue Semrau has a young squad that has been hit with a number of injuries. They played hard, but had difficulty with Notre Dame’s transition game. Junior guard, Nicki Ekhomu played a stellar game for the Seminoles. She led the team with 26 points including 3 of the team’s 9 three-point baskets for the game. She went 11 for 11 from the free throw line, and had 6 assists and just one turnover. Leading scorer Kiah Gillespie added 17 points and 11 rebounds, but only made 7 of her 22 attempts from the field. 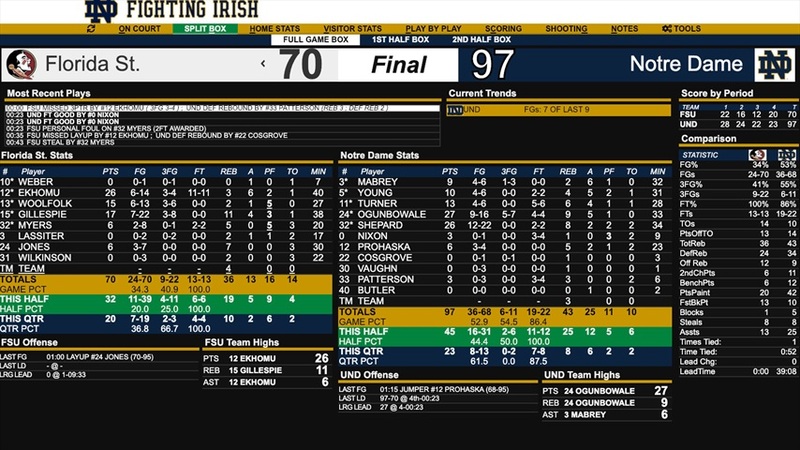 The Seminoles only connected on 34.3% of their shots, while Notre Dame ended up at 52.9% for the game. Brianna Turner added 13 points for the Irish to go with 6 rebounds, 4 assists and just 1 turnover. Jackie Young scored 10 and Marina Mabrey added 9. Mabrey had 6 assists and 1 turnover. Freshman Abby Prohaska added 6 points (3-4 from the field) and chipped in with 5 rebounds, 2 assists and 2 steals in 23 minutes. Dani Patterson and Jordan Nixon each made 3 of 4 field goal attempts for three points each. The Irish ended with a total of 25 assists on 36 made baskets. ND won the rebounding battle 43 to 36. Mikayla Vaughn suffered a head injury in the first half and left the game. McGraw said she suffered a concussion and will miss the next game. The Irish are back on the road for their next two games — the first, a repeat match with Boston College in Chestnut Hill. The Irish topped the Eagles 92 - 63 at home three weeks ago. After the rematch with BC, the last two regular season road games will be against ranked teams — NC State next Monday and then Syracuse one week later. Today’s win improves Notre Dame’s record to 22-3, 9-2 in the ACC. Florida State drops to 21-4, 8-3 in conference.